BRISTOL - The Bristol Blues have had a luxury this summer with Emory University’s Richard Brereton on the team. 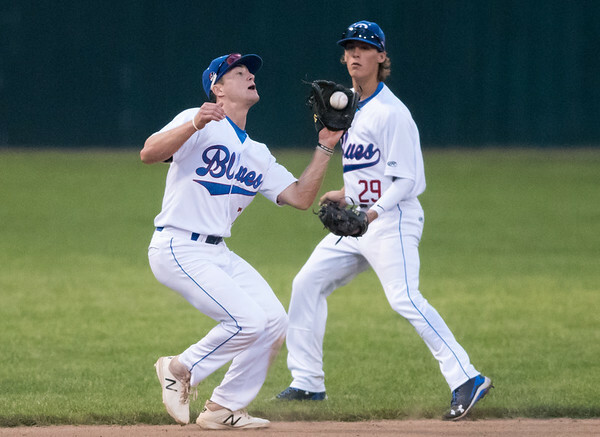 In Brereton, the Blues have gotten a player who has shined both on the mound and in the batter’s box. But that’s something that isn’t new for the Darien native. In the 3-2 Bristol win Tuesday night against the Pittsfield Suns, Brereton once again showed his dominant ability on the mound. He pitched six scoreless innings allowing two hits and issuing a pair of walks with seven strikeouts. It was his first time on the mound since July 5. Over the season Brereton boasts a .274 batting average in 157 at bats with 13 stolen bases to accompany a 1.01 ERA on the mound with 25 strikeouts in 17 2/3 innings pitched. In other words, Brereton is as good as it gets in the Futures Collegiate Baseball League right now. While Brereton loves playing both sides of the ball, the long-term goal is to get to the next level - playing affiliated baseball with a professional organization. In order to do so, he’d be willing to make the move to playing just one side of the ball if the opportunity presents itself to him and that’s the offer. Until he’s told otherwise, Brereton is going to keep playing on both sides of the ball and everything he’s done this summer in Bristol suggests he’s going to be able to keep doing so. Posted in The Bristol Press, Bristol Blues on Wednesday, 1 August 2018 18:19. Updated: Wednesday, 1 August 2018 18:22.